පානදුර එළුවිල මුස්ලිම් පල්ලියට ප‍්‍රහාරයක් එල්ල කිරීමේ සිද්ධිය සම්බන්ධයෙන් අත්අඩංගුවට ගැනීමට සොයමින් සිටි සරසවි සිසුවකු අද (19) කොළඹ අපරාධ විමර්ශන කොට්ඨාසය විසින් අත්අඩංගුවට ගනු ලැබූ බව පොලිසිය කියයි. මෙම සැකකරු සබරගමුව විශ්ව විද්‍යාලයේ කළමනාකරණ පීඨයේ සිසුවෙක් බවත් ඔහු නීතිඥවරයකු මාර්ගයෙන් කොළඹ අපරාධ විමර්ශන කොට්ඨාසයට බාරවීමෙන් පසු අත්අඩංගුවට ගත් බවත් වාර්තාවේ. සැකකරු ඇතුළු පිරිසක් ඉකුත් මැයි 17 වැනිදා එළුවිල මුස්ලිම් පල්ලියට ප‍්‍රහාර එල්ල කළැයි කියන සිද්ධියක් සම්බන්ධයෙන් ලැබුණු පැමිණිලි මත කොළඹ අපරාධ විමර්ශන කොට්ඨාසය පරීක්ෂණ ආරම්භ කර ඇති බව පොලිසිය කියයි. එම පරීක්ෂණ අනුව මෙම සිද්ධියට සම්බන්ධ සැකකරුවන් පස් දෙනකු මීට පෙර අත්අඩංගුවට ගෙන පානදුර මහේස්ත‍්‍රාත් අධිකරණයට ඉදිරිපත් කිරීමෙන් පසු මෙම මස 30 දක්වා රිමාන්ඞ් බාරයට පත්කර ඇත. එම සැකකරුවන් පස් දෙනා අතර භික්ෂුන් වහන්සේ නමක්, පොලිස් කොස්තාපල්වරයෙක්, මුස්ලිම් ජාතිකයින් දෙදෙනකු හා ද්‍රඩිඩ ජාතිකයෙක් සිටින බවද පොලිසිය කියයි. කුරුණෑගල, මල්ලවපිටිය මුස්ලිම් දේවස්ථානයකට පෙට්‍රල් බෝම්බ ප්‍රහාරයක් එල්ල කිරීමේ සිද්ධිය සම්බන්ධයෙන් ප්‍රශ්න කිරීම සඳහා බොදුබල සේනාවේ ක්‍රියාකාරීන් ලෙස කටයුතු කරන පුද්ගලයින් දෙදෙනෙකු අද (15) අත්අඩංගුවට ගෙන තිබේ. මෙම බෝම්බ ප්‍රහාරය සම්බන්ධයෙන් කුරුණෑගල ‍පොලිස් ස්ථානයේ විමර්ශන කණ්ඩායමක් විසින් පුළුල් විමර්ශනයක් ආරම්භ කෙරිණි. මේ සිද්ධිය සම්බන්ධයෙන් තවත් පුද්ගලයින් සිව් දෙනෙකු අත්අඩංගුවට ගැනීම සඳහා ‍පොලීසිය විමර්ශන කටයුතු පවත්වන අතර ඔවුන් දැනට ප්‍රදේශයෙන් පලා ගොස් සැඟව ගොස් ඇති බව ‍පොලීසිය පවසයි. කොළඹ සංවිධානාත්මක අපරාධ කොට්ඨාශයේ නිළධාරීන් කණ්ඩායමක් විසින් කුරුණෑගල කොස්කැ‍ලේ ප්‍රදෙශයේදී ගලගොඩඅත්තේ ඥානසාර හිමියන් අත්අඩංගුවට ගැනීමට යාමේදී ඇති වූ සිද්ධියෙන් පසුව මල්ලවපිටිය මුස්ලිම් දේවස්ථානයට මෙම බෝම්බ ප්‍රහාරය එල්ල කරන ලද බව ‍පොලිස් මාධ්‍ය ප්‍රකාශක කාර්යාලය පවසයි. බොදුබල සේනා සංවිධානයේ මහ ලේකම් ගලගොඩඅත්තේ ඥනසාර හිමියන් වහාම අත්අඩංගුවට ගෙන අධිකරණයට ඉදිරිපත් කිරීමට කොටුව මහෙස්‌ත්‍රාත් අතිරේක දිසා විනිසුරු ලංකා ජයරත්න මෙනවිය ඊයේ (15 දා) වරෙන්තු නිකුත් කළාය. සැකකාර ගලගොඩඅත්තේ ඥනසාර හිමියන් අධිකරණය හමුවේ පෙනී නොසිටීම සම්බන්ධයෙන් උන්වහන්සේ වෙනුවෙන් පෙනී සිටි ජනාධිපති නීතිඥවරයා හා නීතිඥවරිය දක්‌වන කරුණුවල දැඩි පරස්‌පරතාවක්‌ පවතින බව පෙන්වා දෙමින් මහෙස්‌ත්‍රාත්වරිය එම වරෙන්තු නියෝගය නිකුත් කළාය. 2014.04.09 වැනිදා වටරැක විජිත හිමියන් ප්‍රමුඛ ජාතික බලසේනා සංවිධානය විසින් කොම්පඤ්ඤවීදිය නිපොන් හෝටලයේදී පැවැත් වූ මාධ්‍ය සාකච්ඡාවට බලහත්කාරයෙන් හා අයුතු ලෙස කඩා වැදී බලපෑම් කිරීම හා කුරානයට අපහාස කිරීම යන චෝදනා යටතේ ගලගොඩඅත්තේ ඥනසාර හිමියන් ඇතුළු හත් දෙනකුට එරෙහිව කොම්පඤ්ඤවීදිය පොලිසිය විසින් පවරා තිබූ නඩු දෙක ඊයේ (15 දා) කැඳවිණි. එහිදී සැකකාර හිමියන් වෙනුවෙන් පෙනී සිටි ජනාධිපති නීතිඥ ටිරන්ත වරලියද්ද මහතා අධිකරණයට පෙන්වා දුන්නේ උන්වහන්සේගේ ජීවිතයට එල්ල වී ඇති මරණීය තර්ජන නිසා අධිකරණය හමුවට පැමිණීමට නොහැකි වී ඇති බවයි. එම කරුණු තමා විසින් අභියාචනාධිකරණය හමුවේදීද පෙන්වා දීමෙන් පසුව අභියාචනාධිකරණය විසින් වරෙන්තු නිකුත් කිරීමෙන් වැළකී සිටි බව ජනාධිපති නීතිඥවරයා එහිදී මහෙස්‌ත්‍රාත්වරියට පෙන්වා දුන්නේය. එම අවස්‌ථාවේදී සැකකාර හිමියන් වෙනුවෙන් එම නඩු කටයුතුවලට පෙනී සිටි නීතිඥවරියක වන සුදර්ශනී ගුණරත්න මහත්මිය කරුණු දක්‌වමින් උන්වහන්සේව අත්අඩංගුවට ගැනීම සඳහා පොලිස්‌ කණ්‌aඩායම් කිහිපයක්‌ යොදවා ඇති බව තමන්ට දැනගන්නට ලැබී ඇති බව අධිකරණ හමුවේදී පැවසුවාය. අධිකරණය( අත්අඩංගුවට ගැනීමට පොලිස්‌ කණ්‌ඩායම් යොදවලා තියෙනවා කියන එක හරි. පොලිසිය පරීක්‌ෂණ පවත්වනවා කියන එක වෙනම කාරණාවක්‌. එහෙම කියලා අධිකරණයට එන්නේ නැති නම් ඒකත් අධිකරණය මඟහැරීමක්‌. නීතිය කාටත් සාධාරණ විය යුතුයි. අධිකරණ හමුවට ඉදිරිපත් නොවන ඕනෑම කෙනෙකුට අනුගමනය කළ යුතු ක්‍රියාමාර්ග නීතියේ සඳහන් වෙලා තියෙනවා. විත්තිය වෙනුවෙන් පෙනී සිටින නීතිඥවරුන් දෙවිධියකට කරුණු දක්‌වනවා යෑයි පෙන්වා දුන් විනිසුරුවරිය එම නඩුව ලබන අගෝස්‌තු 10 වැනිදා යළි කැඳවන ලෙසට නියෝග කරමින් එම වරෙන්තුව නිකුත් කළාය. Exactly three years have lapsed since the Aluthgama riots - a seismic event in the history of Sri Lanka’s troubled ethnic relations. 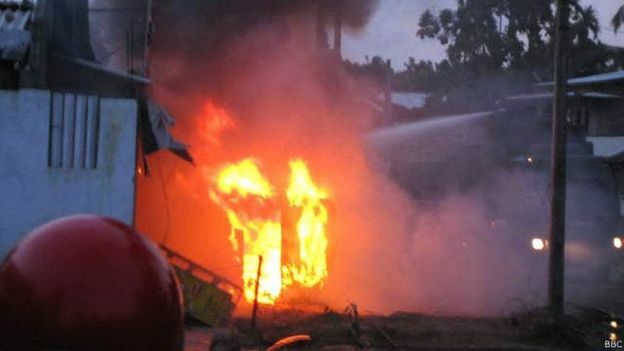 June 15 and 16, 2014 saw mobs in a well-organised manner, unleash collective violence on Muslim-owned businesses and homes in Aluthgama, Beruwala, Dharga Town, Welipenna and Matugama in the district of Kalutara, located along the island’s south-western coastal belt. The rioting resulted in the loss of four lives, injuries to 80 and caused extensive damage to property. Apart from the tangible losses, the violence of June 2014 brought into full focus the very real and devastating consequences of a coordinated programme by divisive forces to drive hatred, fear and suspicion into the minds of the Sinhala-Buddhist population. A result of the anti-Muslim sentiment cultivated in the post-war period, the rioting and looting in Aluthgama and its neighbouring towns marked one of Sri Lanka’s darkest moments, severely impairing relations between the country’s Buddhist and Muslim communities on the one hand, and among the minorities and an indifferent then government on the other. Just a little over two weeks later, on December 19, 2014, the ‘Maithri Manifesto’ was released promising swift and sweeping reforms. Based entirely on propaganda, this virulent anti-Muslim campaign conjured a narrative in which the Muslim minority was falsely portrayed as representing economic, cultural, demographic and political threats to the Sinhala-Buddhist majority. By levelling unsubstantiated allegations of growing ‘radicalisation’, it sought to demonise the vastly peaceful and well-integrated Muslims of Sri Lanka. Aluthgama was the culmination of a hate campaign which began on September 10, 2011 with the demolition of a Muslim shrine in Anuradhapura, believed to have been around 400 years old. As the monk-led mob attacked the religious site, police personnel stood by watching idly. Eerily enough, the visuals of the incident exposed the crux of the issue: the unwillingness of law enforcement agencies to enforce the law, and arguably even their complicity in the crimes, as violence targeting the country’s Muslim and Christian minorities escalated sharply over the suceeding months. In their treatment of the monks and their lay supporters as somehow above the law, the police, possibly were well-aware of the political patronage these discordant groups enjoyed, thus emboldened them in their vigilante actions. It was on April 20, 2012, around 200 Sinhalese including Buddhist monks staged a protest outside the Khairiya Jumma Masjid in Dambulla demanding the removal of the ‘illegally constructed’ mosque from a ‘Buddhist Sacred area’. Despite a formidable police presence, the protestors were able to disrupt the traditional Friday Muslim prayers, and some among them broke into the mosque and caused damage to Islamic religious texts and property. The actions of an apparently fringe minority of Buddhist clergy and lay persons are not representative of Buddhism with its emphasis on pacifism and non-attachment just as much as actions of the anti-Islamic; so-called Islamic State (IS) are not representative of Islam. Yet there has been no condemnation of the recent spate of hate crimes by Buddhist spiritual leaders. There has been no vocal calls by them to return to the Buddhist values of tolerance and non-aggression in the way Muslims the world over are expected to condemn the atrocities committed allegedly in the name of Islam and disassociate Islam from IS. The silence of the Sinhala-Buddhist majority, notably the Maha Sangha, on the growing hostilities, hate speech and anti-minority attacks in post-war Sri Lanka is perhaps an indication that these extremist groups are capitalising on deep-seated prejudices against the minorities - the Muslims in particular of recent times. The core assertion of the nationwide campaign to fuel and intensify ethnic tension led by the Bodu Bala Sena (BBS) and supported by groups such as the Sihala Ravaya and Ravana Balaya is that Buddhism is under threat - and that Muslims are now the primary threat - must have sunk into the recesses of the minds of a fairly significant proportion of Sinhala-Buddhist society. This is also compounded by the Mahavanmsa mind-set which regards Sri Lanka as a Sinhala-Buddhist land where others may live so long as they accept the primacy of the Sinhala-Buddhist race. Chauvinism thus gave rise to direct and violent attacks on Muslims that night and the next day. 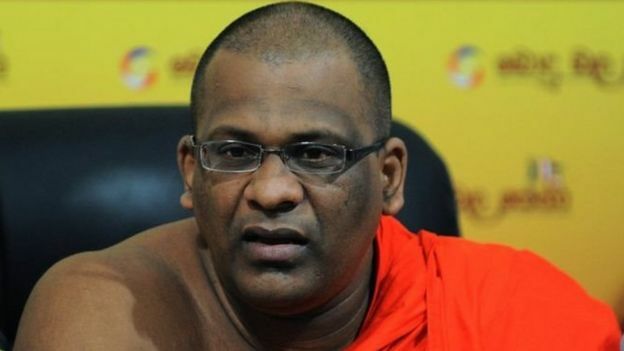 The Aluthgama attacks appear to have been hurriedly planned by the Buddhist extremist groups following the spread of a false rumour on June 11; just two days earlier that a Buddhist monk had been attacked by a Muslim near a temple in the area. The fact was that a Muslim-owned trishaw parked haphazardly on a narrow lane leading to the temple had obstructed a van transporting a monk to the temple which had led to angry words being shouted by the van driver at the missing trishaw driver who turned up to be assaulted by the van driver. It was a minor incident of two drivers hitting each other with neither being even injured. Meanwhile the monk had alighted from the van and intervened to prevent further incidents by which time neighbours had informed the police that a monk was being attacked, which did not happen at all. The false report of a monk being assaulted spread like wildfire leading to a sizeable crowd gathering outside the police station which led to three Muslims being remanded. It was two days later, the BBS exploited the minor incident by a public hate speech inciting violence against the Muslims of the area without intervening to settle the issue or allowing the law to take its course. The BBS-led public rally in the heart of the tension- ridden area resulted in four deaths and widespread destruction of Muslim property while engendering fear and demanding subservience. An historic agreement was signed on December 1, 2014 to field a common candidate to defeat the incumbent at the January 2015 presidential election. 36 political parties and civic groups entered into a Memorandum of Understanding (MoU) at the Viharamahadevi Open Air Theatre in a bid to restore democracy, stability and good governance in Sri Lanka. The MoU which was signed at a time Sri Lankans were desperate for change took cognisance of the country’s predicament. It averred that a country once seen as a model of democracy had degenerated into a place where its citizens were no longer able to live in dignity and safety. Manifestations of this reality, the agreement noted, was evident in (amongst other factors): the total breakdown of the rule of law and the severe strain on co-existence among different ethnic and religious communities. Taking into account the above, the agreement stressed the need to guarantee the primacy of the rule of law, restore democracy on the foundation of good governance, secure and advance fundamental rights and freedom, and to ensure the human right to live in dignity. Just a little over two weeks later, on December 19, 2014, the ‘Maithri Manifesto’ was released promising swift and sweeping reforms. When Sri Lankans went to the polls on January 8, 2015 to elect a new president, they voted decisively in favour of change. Having endured violence, fear and discrimination, the peaceful majority of diverse ethnicities gave a fresh mandate to the ‘Yahapalanaya’ coalition to live in a climate of freedom, dignity and equality. The Muslim community, revolted by the manner in which extremist groups were allowed to operate with impunity under the Rajapaksa government, voted en-bloc for the common candidate.Yet, two and-a-half years into the Yahapalanaya rule, a renewed sense of fear has gripped the Muslims of Sri Lanka. Anti-minority activities have re-surfaced, with Muslim properties - notably shops being attacked almost on a daily basis. Even as the innocent victims of the Aluthgama riots await justice three years on with the new government taking no action, a new form of low-intensity violence - dubbed ‘A Shop a Day’ – has created a climate of fear in place of the climate of hope that prevailed during the early days of President Sirisena administration. According to the Police, 16 major racially-motivated incidents targeting Muslims have taken place across the island since April 2017, while Muslims put the number at 30 incidents. Beyond the rhetoric of holding perpetrators accountable, no effective action has been taken towards this end. There is a deep sense of scepticism even about the recent arrests made as the firebrand monk Gnanasara Thera, the key instigator, is still at large. The false belief that the problem lies in the ‘extremist’ ideas being propagated within Muslim society is deeply troubling. This notion makes it harder to mitigate the rising inter-religious tensions and to build mutual trust among communities. It is to the credit of the Muslims that they have remained peaceful and patient in the face of continued provocation. However, one cannot altogether dismiss the idea that an undercurrent of anti-Muslim sentiment was always there, that the end of the war simply gave a window for this to emerge. There are genuine concerns among the Sinhala-Buddhist population about the survival of their religion and culture, an anxiety that has been misdirected at minorities through false propaganda. As Walton rightly points out, policy responses must find a way to engage with groups interested in the protection of Buddhism while making it clear that violence will not be tolerated. This is in the interest of all communities in Sri Lanka. Just as much as apprehending those behind the violence is essential to end the culture of impunity that prevails, it must be coupled with a proactive approach in which Buddhism is assured of its ‘primus-inter-pares’ status. Unless such an approach is adopted, Sri Lanka is likely to remain trapped in ethnic friction for years to come. යම්කිසි ජන වර්ගයකට, ආගමකට විරුද්ධව ප්‍රචණ්ඩ ක්‍රියාවල යෙදෙන පිරිස, එමෙන්ම වෛරය පැතිර වීමට ක්‍රියා කරන අයට විරුද්ධව නීතිය අනුව පියවර ගැනීම සඳහා පොලිසියට උපදෙස් දීමට කැබිනට් මණ්ඩලය තීරණය කළා. මෙම ක්‍රියාව අපේ ප්‍රතිපත්තිය යළිත් තහවුරු කිරීමක් පමණයි. මෛත්‍රීපාල සිරිසේන ජනාධිපතිතුමා 2015 ජනවාරි 8 වැනි දා දිවුරුම් දුන්නේ මෙරට ප්‍රධානියා ලෙස සංහිදියාව ස්ථාපිත කිරීමටයි. එමෙන්ම ජාතික එකඟතාවය ඇති කිරීමටයි. වසර 30 ක යුද්ධයක පැටලී සිටි අපට ඉන් පසුව මෙරට ජනතාව එකතු කර ඉදිරි ගමනක් යාමට තීරණය කර තිබෙනවා. අප සිංහලයකු, බෞද්ධයකු වීම පිළිබඳව ආඩම්බරයි. එමෙන්ම ශ්‍රී ලාංකිකයකු වීම පිළිබඳවත් ආඩම්බරයි. ශ්‍රී ලාංකිකයකු ලෙස මා සෑම ආගමකටම ගරු කරනවා. එමෙන්ම සෑම සංස්කෘතියකටම ගරු කරනවා. වෙනත් සංස්කෘතීන්, වෙනත් ආගම් හෙළා දකිනවා නම් ඔහු සැබෑ ශ්‍රී ලාංකිකයකු වීමට හැකියාවක් නැහැ. යහපාලන රජය මෙරට සියලූම ශ්‍රී ලාංකිකයන්ට එක සමාන අයිතීන් සමඟ සාමයෙන් ජීවත් වීමට අවස්ථාව ලබා දෙනවා. මුස්ලිම් ව්‍යාපාර සහ දේවස්ථාන කිහිපයකට පහර දීම නිසා ඇති වූ තත්ත්වය පිළිබඳව පුළුල් විමර්ශනයක් කිරීමට පොලිසියට බාර දී තිබෙනවා. ඒ ගැන ක්‍රියා කොට තත්වය සමතයකට පත් කරාවි. ඕනෑම ආගමකට, ජන වර්ගයකට විරුද්ධව ක්‍රියා කරනවා නම්, ප්‍රචණ්ඩ ක්‍රියාවල යෙදෙනවා නම් ඔවුන් පිළිබඳව විභාග කොට අත්අඩංගුවට ගෙන අධිකරණයට ඉදිරිපත් කිරීමට කටයුතු කරනවා. ඒ කටයුතු පොලිසිය විසින් විභාග කරනවා. ඇතැම් අවස්ථාවල නීතිය ක්‍රියාත්මක කර තිබෙනවා. එම එක් කාරණයක්වත් අතහැර නොමැති බව මෙහිදී ප්‍රකාශ කළ යුතුයි. එම නිසා පොලිසිය මෙන්ම අනෙකුත් අදාළ ආයතන සියල්ලකටම නීතිය සහ සාමය ආරක්‍ෂා කිරීම සඳහා දැනුම් දී තිබෙනවා. අවශ්‍ය නම් පාර්ලිමේන්තුවට ඉදිරිපත් කොට නව නීති සම්පාදනය කර ගැනීමට ද හැකියාව තිබෙනවා. අග්‍රාමාත්‍ය රනිල් වික්‍රමසිංහ මහතා විශේෂ ප්‍රකාශයක් සිදු කරමින් පැවසිය. නුගේගොඩ සහ විජේරාම ප‍්‍රදේශයේ මුස්ලිම් ව්‍යාපාරිකයන්ට අයත් ස්ථාන හතරට ගිනි තැබීමේ සිද්ධින් සම්බන්ධයෙන් පසුගියදා අත්අඩංගුවට ගෙන සිටින ප‍්‍රධාන සැකකරු 2014 වසරේ සිට බොදු බලසේනා සංවිධානය සමග සම්බන්ධකම් පවත්වන කි‍්‍රයාකාරි පුද්ගලයෙක් බව පොලිස් මාධ්‍ය ප‍්‍රකාශක නියෝජ්‍ය පොලිස්පති පි‍්‍රයන්ත ජයකොඩි මහතා අද(11) පැවසීය. 32 හැවිරිදි මෙම සැකකරු මෙම වෙළෙඳසල් වලට ගිනි තැබීමේ සිද්ධියට සෘජු ලෙස සම්බන්ධ වී ඇති බවට තොරතුරු හෙළි වී ඇති බවද පොලිස් මාධ්‍ය ප‍්‍රකාශකවරයා සඳහන් කළේ අද රජයේ ප්‍රවෘත්ති දෙපාර්තමේන්තුවේ පැවැති ප්‍රවෘත්ති සාකච්ඡාවකදී ය. ‘පොලිස්පති පුජිත් ජයසුන්දර මහතාගේ අධීක්ෂනය යටතේ මෙම පරීක්ෂණ ජ්‍යෙෂ්ඨ නියෝජ්‍ය පොලිස්පතිවරයකුගේ අධීක්ෂණය යටතේ සිදුවෙනවා. දිවයිනේ විවිධ ප‍්‍රදේශවල වාර්තා වී ඇති සෙසු සිද්ධීවලට අයත් සැකකරුවන් අත්අඩංගුවට ගැනීමට පොලිසිය පරීක්ෂණ කටයුතු සිදුකරනවා. ජාතීන් සහ ආගම් අතර විරසකට ඇති කිරීමට කි‍්‍රයාකරන කී‍්‍රයාකාරීන් පිළිබදව පොලිසිය ඉතාමත් අවදානයෙන් පසු වෙනවා. එවැනි කණ්ඩායම් වලට එරෙහිව තදින් කි‍්‍රයාත්මක කරනවා. දිවයින පුරා මේ අයුරින් පහර දීමේ සිද්ධීන් 16 වාර්තා වී තිබෙනවා. එම සිද්ධීන් සම්බන්ධයෙන් මහරගම සැකකරුට අමතරව ති‍්‍රකුණාමලය සහ දන්තුරේ ප‍්‍රදේශවල තවත් පුද්ගලයින් තිදෙනකු අත්අඩංගුවට ගෙන තිබෙනවා‘ යැයි ද පොලිස් මාධ්‍ය ප්‍රකාශකවරයා සඳහන් කළේය. Zakat functions as a social security for all. Those who have enough money today pay for what they have. If they need money tomorrow, they will get what is necessary to help them live decently. Zakat payer pays his dues to Allah as an act of worship, a token of submission and an acknowledgment of gratitude. The receiver of Zakat receives it as a grant from Allah out of His bounty, a favor for which he is thankful to Allah. · Causes Allah's forgiveness and blessings. Alqamah Radhiallaho anho says that when our group of people visited Rasulullah Sallallaho alaihe wasallam he said to them, "Verily you can make your Islam perfect by your payment of the Zakaat due on your property". Rasulullah Sallallaho alaihe wasallam said, "he who observes three things will taste the sweetness of Imaan (faith): One who worships Allah alone and believes (from his heart) that there is no one to be worshipped but Allah and one who pays the < i>Zakaat on his property, willingly, every year. In Zakaat on the animals, one should not give an aged animal or one suffering from itch or any other ailment, or an inferior one, but should give animals of average quali ty. Allah Ta'ala does not demand from you the best of your animals, nor does He command you to give animals of the worst quality". Cabinet Spokesman and Health Minister, Rajitha Senaratne said today a warrant has been issued for the arrest of Bodu Bala Sena leader Galagodatte Gnanasara Thera and CID detectives have been deployed to take him into custody over allegations of inciting religious and racial hatred. Responding to a journalist at yesterday’s weekly news briefing, he said it would be a difficult task for the police to arrest him if he was being protected by a minister. Journalist: There are media reports that he is being protected by a minister. Spokesman: Possible. That is why the police have been unable to arrest him. Sri Lanka is not such a big country nor were there so many hiding places for him to hide. Journalist: Why only Gnanasara Thera. Why don't the police arrest Tamil and Muslim racists? Minister: He has been directed to appear in Court to answer allegations made against him by the Police. His language is extremely insulting and he has called Muslims Thambiyas and Marakkalayas. He has also allegedly attempted to incite people against other ethnic groups. The Muslim and Tamil politicians have not done that but have demanded their rights. Talking about your rights or making a statement to that effect will not create divisions among people. Journalist: Mosques have been attacked even after Gnanasara Thera has gone under ground. That means he is not responsible for the attacks. Minister: True. But anyone who wants to prove his innocence can attack a mosque. He said some Eastern Muslim MPs met him recently to complain about the attacks on Muslims and he will discuss the matter with them shortly and appraise the President and the Prime Minister on this matter.